Dr. D'Angio's research focuses on immunizations and infections in the premature infant. He has recently led federally-funded multi-center studies investigating the responses of premature infants to the conjugate pneumococcal vaccine and influenza vaccine. He is the principal investigator of the Premature Infant Vaccine Collaborative, formed to evaluate vaccine immunogenicity in premature infants. 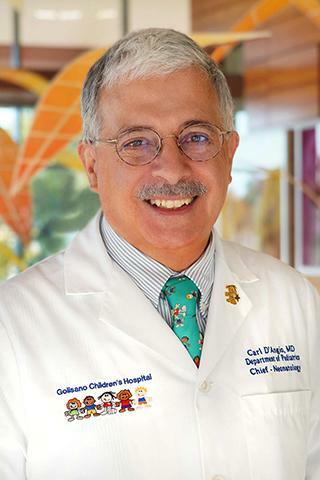 He is principal investigator for a combined University of Rochester-University of Buffalo site in the NICHD Neonatal Research Network, an 18-center consortium performing research in newborns. He is a co-investigator on NIH grants investigating respiratory infections and outcomes in the premature infant. Dr. D'Angio is also involved in research into prevention of catheter-related infections, neonatal outcomes and clinical and research ethics. Meyers JM, Tan S, Bell EF, Duncan AF, Guillet R, Stoll BJ, D'Angio CT, . "Neurodevelopmental outcomes among extremely premature infants with linear growth restriction." Journal of perinatology : official journal of the California Perinatal Association.. 2019 Feb 0; 39(2):193-202. Epub 2018 Oct 23. Ryan RM, Feng R, Bazacliu C, Ferkol TW, Ren CL, Mariani TJ, Poindexter BB, Wang F, Moore PE, . "Black Race Is Associated with a Lower Risk of Bronchopulmonary Dysplasia." The Journal of pediatrics.. 2019 Jan 4; Epub 2019 Jan 04. Khalak R, D'Angio C, Mathew B, Wang H, Guilford S, Thomas E, Meyers J. "Physical examination score predicts need for surgery in neonates with necrotizing enterocolitis." Journal of perinatology : official journal of the California Perinatal Association.. 2018 Oct 18; Epub 2018 Oct 18. Chapter Title: Laboratory aids for diagnosis of neonatal sepsis. Author List: Weinberg GA, D'Angio CT. Author List: Kainth M, D'Angio CT.